Belle Beach House sur le lac Arrowhead dans Adams County dans le centre du Wisconsin. 3 chambres chacune avec un lit queen, 2 salles de bains, un grand loft avec 6 lits jumeaux, dort à la maison 12. Ouvrir grande salle avec cheminée feu de bois a deux ensembles de portes coulissantes en verre sur le pont surplombant le lac. Grande cuisine entièrement équipée ouverte sur une grande chambre avec île pouvant accueillir 3. Une grande table à manger pouvant accueillir 12. Véranda a une table à manger pouvant accueillir 12 plus d'un coin salon. Il y a un gril à gaz à côté du porche. foyer extérieur et aire de pique nique avec gril à charbon dans la cour. embarcadère privé inclus. Location de bateau est disponible à proximité. Lake Arrowhead est un ressort lac alimenté 325 acres approvisionné avec des basses, dans le nord, le doré et le poisson de la poêle. Profitez de la navigation de plaisance, pêche, ski nautique, etc. Pendant l'été, l'équipe de ski Shermalot effectue deux fois par semaine. Deux parcours de golf de 18 trous, les pins et les lacs (deux 4 1/2 Cours en nombre d'étoiles). Les installations incluent 2 piscines en plein air chauffées de natation, 2 pavillons, 2 courts de tennis éclairés, terrains de basket / volley-ball, des pavillons, plein restaurant et un salon, des zones de plage entretenues avec des équipements de jeux et de mise à l'eau. Les activités d'hiver à Lake Arrowhead comprennent la luge, le ski de fond (sentiers qui parcourent le terrain de golf), patin à glace (sur l'étang au club house), plus de 270 miles de sentiers de motoneige connecté, sentiers comté de VTT, pêche sur la glace, et en hiver des promenades sur le lac gelé. La chasse est à proximité et le ski et les tubes sont à 45 minutes en voiture. Les chiens sont acceptés. Les animaux domestiques sont acceptés avec un supplément de 20 USD par nuit et par chien et doivent être organisés à l'avance. Disponible pour les week-ends ou des semaines entières à l'automne, l'hiver et le printemps. Location à la semaine en été vendredi au vendredi. Une salle de bain est à l'étage principal avec les 3 chambres, grande salle, cuisine, salle à manger. L'autre salle de bains est à l'étage inférieur. Second time here!!! Love this place with all its amenities!!!! Girls weekend was a huge success in this gorgeous home. Beautiful home. It was 10 below but me and 5 of my friends still had a great time. Had a fire in the fire place, watched a fox run around the entire lake, and one of my brave friends went ice fishing. This place would be incredible during the summer! Ben, thank you so much for the nice review. I am glad that you and friends had a good time! We drove out form Minneapolis to meet friends from the Chicago area, so the location was a perfect meeting point in the middle. This is a beautiful cabin tucked away in the woods only a short walk to the water. Everything we needed to enjoy a great weekend was at our fingertips, we will definitely be back to enjoy another weekend soon. Debi was a great host, answered all questions within a short turnaround. I would highly recommend this cabin to anyone looking to get away for a long weekend. Shane, thanks so much for the nice review....glad you and your friends had fun! Great place we went with friends and it worked out well for all of us. Very clean and relaxing. 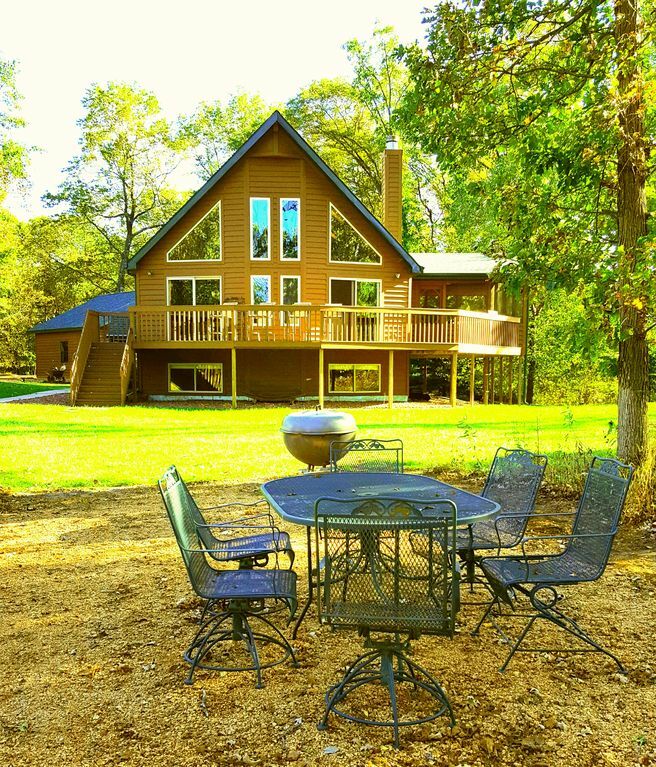 We rented the lake house this past weekend for 3 nights for a golf trip to Sand Valley. Location was easy being only a couple miles to the course, the house itself was a great for what we needed which was simply a place to have a drink in the evening after a long day of golfing. the home was equipped with everything we needed, any issues previously noted about no towels etc were alleviated and we didn't feel anything else was needed for our trip, it was very well stocked. Property is seasoned, it is not fancy but very well maintained, very clean and honestly perfect for 4 guys getting away for a long weekend. A great lake cottage. We took full advantage of the natural gas BBQ and great areas to socialize, only suggestion we would make would be to expand the cable package. We fully recognized most people rent this home for the lake access and hence do not plan to be watching TV but on a boys trip having access to ESPN and the golf channel would have been nice. Over all, great place to rent from the weekend golfers perspective, if we come back to Sand Valley we would rent here again. Thanks for the nice review Jeff. I am working on the cable situation. Our provider just changed the packages and I ended up down grading (which I see was a mistake for my golf groups). I was attempting to cut the cord, but I see I don't know exactly what I'm doing. My husband thought I was nuts as well. Anyways glad you enjoyed yourselves and I'll be fixing the TV situation soon. Great spot for golf trip. On Arrowhead property and less than 5 minutes to Sand Valley. Well appointed, back deck, fire pit, screened porch. Towels would be a plus for guests via air travel. Would stay again, owner easy to work with. Thanks for the nice review Tom. Just recently I have been looking at ways to supply towels for guests that fly in. Before Sand Valley most of my guests have lived in the area and drive to The Beach House, so it wasn't an issue. But I understand that it must be an inconvience for those of you that fly. I should have this resolved well before your next outing. région de Chicago est un 3 1/2 heures de route; Milwaukee est une heure de route de 2 1/2, et Madison est un lecteur 1 1/2 heures. Lac Petenwell, le 2ème plus grand lac intérieur dans le Wisconsin avec 23,000 acres de pêche et le canotage à seulement 5 minutes de route. Wisconsin Dells parcs aquatiques sont à environ 45 minutes en voiture. Ski - Cascade Mountain et Granite Peak sont à environ 1 heure. Équitation, randonnée, et des visites de marais de canneberge sont à proximité. Grandes pistes cyclables à Wisconsin Rapids long de la rivière. The Beach House est sur le lac Arrowhead à Rome avec une adresse Nekoosa. Must be 27 years or older to rent. Limit of 2 dogs, they must be at least 1 year old. Charge for dog is $20 per night. Must have prior approval for dogs. Damage protection must be purchased.